For those of you who can not play the stock version here is the psp version, it work with all andriod phone including those with lollipop update Os. Pro Evolution Soccer is a football game that is very popular as PES. Pro Evolution Soccer is made ​​by Konami's famous first through the Playstation platform. PES is available for all platforms, namely Nintendo, Wii, Xbox 360, and PC. 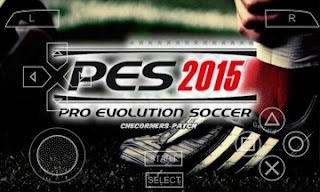 Now PES Games for PSP Android ISO already present and can be enjoyed in your favorite Android Device. Actually on this PSP Games Base version is still on the version of PES is far below about PES 2010 or 2012, but because of the many talented developers in renewing and tweaking and making a patch to Update Emulator PPSSPP until the Players from various football clubs would have updated as players who have passed the period - Transfer time players. Note: This is a PSP version it will work on all Android phone with lollipop update, so if you are having issue of not been able to play the previous version on your lollipop update. Here you will be able to do so here. 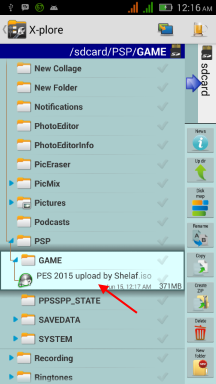 PES 2015 Android PPSSPP Game is big enough that around 371MB and already formatted ISO so you do not need to extract. The installation method is quite simple. 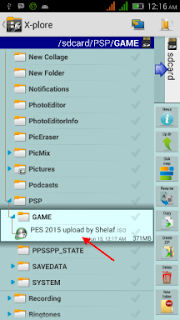 You just need to move the files PES015.ISO game to your Android (external sdcard) then the game automatically detected. Share This: If you want to appreciate this, have Questions to ask or have anything to contribute, kindly use the comment form below. More so, Remember use the "Share", "Like" and other Share buttons to share this post with your friends. Yeah! its cool, but at least you can now play this on lollipop Android until we are able to rectify the previous version. Please can you create a mirror link for the psp.iso data. i have ben trying to download it since but theres too much traffic there. welcome sam, there are too many download on that link. Thats why, just be patience, the link will be open again. This is what google keeps telling me when I try to download the file. Make some adjustment on the volume, audio, go to settings and do that. Then locate it via ES xplorer. it might be on the Phone memory. Thats the complete details above.. Why not use ES Explorer or any default file manager on your phone to located it. then move it to SD Card. can i just download the "PES 2015 ISO data" and play it on PSP ? Sure! if you know what you doing.. Yes! Where have you been? It's has been out for some months now. Don't tell me you have not been following us, lol. Anyways, Kindly go to the TechPill.net homepage and download it. Enjoy.